By definition, the “Destination Campaign” hosted by the 47 prefectural governments of Japan and the six JR companies, is the largest tourism promotion campaign in the country. JR companies work with their local prefectural governments during this 3-month campaign. July, August, and September of 2011 is Gunma's turn. The JR East Japan and the Kencho (the Gunma Prefectural Government) will launch a nationwide advertising campaign using JR's huge network to attract tourists from outside of Gunma. The Gunma tourism industry is ready to welcome guests with the best they have to offer in terms of sightseeing, dining, and hospitality. Oze signifies the beauty of Gunma's rich natural environment. It is frequently referred to as Japan's natural holy sanctuary and is also known internationally as a botanical treasure house. Read about more places of scenic beauty in Gunma: Mt. Myogi, Kusatsu Spa Resort, Watarase Keikoku Rail Transport, & many others. In the crystal-clear stream, you can have fun catching fish with nothing but your hands, enjoy black-water rafting, or taste the local dishes on the deck built on the stream. Want to cool off on a hot summer day? Here's your chance. No entry fee is required. Gunma is one of the largest producers of fruits in Japan. Fruits of all varieties are grown throughout the year. Look at the fruits calendar in the attached PDF file to see if you can find your favorite kind. Gunma is the third largest producer of wheat in Japan. With such a background, local delicacies using wheat flour such as okirikomi or soup noodles, yakimochi or roasted buns, and yakimanju (PDF/154KB) were made and eaten on a regular basis. At Takumino-sato, there are DIY workshops (PDF/575KB) of soba and udon noodles. You can also find DIY workshops of handicrafts there. Pick-your-own-fruit parks in Gunma in PDF file. “Tomioka Silk Mill and Related Industrial Heritage” has been inscribed on the Japanese Tentative List of World Heritage Sites since 2007. The silk mill had played an indisputable role in Japan's modernization after nearly 300 years of national seclusion. The state-run mill was built in Gunma, where, at the time, sericulture flourished. Read more about the history of sericulture in Gunma by clicking the URL below. 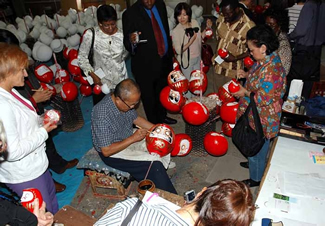 Takasaki is known as the host city of the “Shorinzan Daruma Doll Fair” and has been the largest producer of daruma dolls in Japan for many years now. How about painting your own, one of a kind, daruma doll for you? For more information about Gunma Destination Campaign, visit the URL below. Maebashi Tanabata prides itself on being the grandest Tanabata festival in the northern Kanto Area, with its beautiful decorations that retain a traditional, yet modern touch. 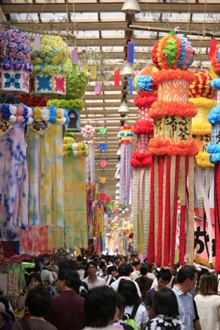 Made of color papers of all shapes and sizes, the Tanabata decorations look very graceful inside the shopping arcade. For more information, please see the PDF file below. Geographically, Shibukawa is located in the center of the Japanese archipelago, and for this is the reason the city came up with the idea of organizing this unique festival. The main feature is the Heso Dancing Parade, in which people paint a face on their bellies and dance along to festival music while marching down the streets of Shibukawa. 2011 marks its 28th year, and the festival is going to be a fund-raising event for the victims of 3.11 earthquake and tsunami. In order to save electricity, the time of festival will also be shifted to during the day. Route 354 is closed to traffic during the Oizumi Festival. Participants pushing floats and carrying portable shrines march along the street. Also, you can see the Minyo Nagashi Odori, where a group of people dressed in summer kimono dance along to Japanese folk music. Route 354 turns into a street bustling with excitement on the festival day. Wild lotus flowers bloom beautifully in pink at this time of the year. 200 different kinds of lotus flowers are being showcased at the Tsutsujigaoka Park Inn in Tatebayashi during the festival. A lotus flower sightseeing boat will take you on a journey into this beautiful world. In Japan, we eat the roots of lotus, and they are very good for you. Lotus root Bento box lunches and pasta will also be offered at the inn during the festival.